A bill introduced to the U.S. Senate aims to create thousands of new visa programs designed to attract top-tier innovators, according to its proponents. Senator Jerry Moran introduced the Startup Act 3.0 legislation in February, and experts have been combing through the details and implications ever since. For top-tier innovators, the legislation represents an easier path to a struggling but powerful economy. The U.S. still dominates the information and technology markets, so online entrepreneurs in particular are keeping tabs on this bill. Two previous renditions of the legislation failed to make it through Congress, but Startup Act 3.0 has momentum and support from both Democrats and Republicans. Startup Act 3.0 would permit 75,000 immigrant entrepreneurs to come to the U.S. for three years. A fixed number of current immigrants would also qualify. To qualify for these visas, foreign-born entrepreneurs would have to raise $100,000 for new businesses and hire at least two employees within a year. If these qualifications are met, the visa would be extended to three years. Part of the bill also modifies the tax code to encourage small business investments. Senator Moran and the bill’s other sponsors believe entrepreneurship is the key to the economy’s vitality. The Kauffman Foundation analyzed the potential employment impact, and the numbers are encouraging. The bill could generate up to 1.6 million jobs over the next 10 years, according to the Kauffman Foundation report. Foreign-born entrepreneurs founded one-quarter of technology and engineering companies between 2006 and 2012. The report lists a baseline of almost 500,000 jobs with the potential for more than 1.5 million. 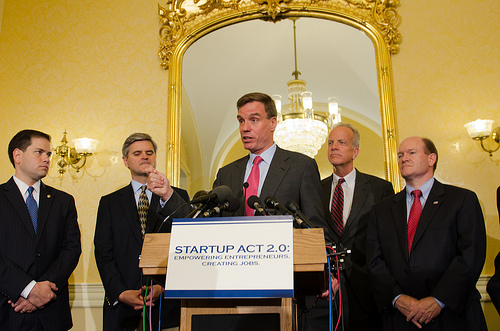 The National Metropolitan Business Alliance (NMBA) expressed its support for Startup Act 3.0. In a letter to Senator Moran, the NMBA declared that the act would boost America’s innovation and facilitate growth. Forbes published a more personal tale of support for the bill written by Nancy T. Nguyen, an entrepreneur born in the Philippines. She describes how foreign entrepreneurs are woven into American history. Without policies that enabled her parents to immigrate, Nguyen wouldn’t have started her own business and become Ms. Corporate America 2011. Much of the support for this bill is based on a broader support for small business in general. From Mark Zuckerberg to Phil Knight to Bob Parsons, the CEO and founder of GoDaddy.com, some of America’s most successful tycoons, like Businessman Parsons and Zuckerberg, started in small offices with few employees. All data indicates small business is good for the economy, and a strong economy is good for everyone. As the sponsors of the legislation continue to raise support, the bill is currently in the hands of a congressional committee. Despite considerable support, a reliable source doesn’t like 3.0’s chance of survival any better than its predecessors. Govtrack.us suggests that the bill has an 8% chance of getting past committee and just a 3% chance of being enacted. That may sound small, but it’s actually average. Just 3% of bills were enacted from 2011-2013, Govtrack.us reports.